To celebrate the golden jubilee of the kingdom of Belgium, Leopold II and Victor Besme decided to make use of a military parade ground and erect a prestigious which was obstructing the development of new suburbs to the northeast of the capital and erect a prestigious building to commemorate the event. The building was part of a vast urban project masterminded by Gédéon Bordiau, who in 1875 proposed the creation of an esplanade (park and museums) which would provide a landmark between the Royal Park and the Château de Tervuren. Drawing inspiration from the Victoria and Albert Museum in London and the Palais de Longchamps in Marseille, he designed a complex consisting of two wings connected by a semicircular colonnade. On 20 June 1880 only the two wings were ready to house the National Exhibition for the Golden Jubilee of the Belgian nation. Only one of the two rose windows on the facade remains: the other was destroyed in 1946 when the Pavillon de I’Antiquité (Pavilion of Antiquity) was ravaged by fire: this was rebuilt 10 years later in a style which, although different, nevertheless respected the overall symmetry of the building. The colonnade was completed in 1888 and the mosaics added in 1920. In 1897 the site was used for the World Fair. The rear halls, whose metal structure was intended to reflect the technology of the times, were then added. The arches alone required eight months’ work (1904-05) and were built by the Frenchman Charles Girault (1851‑1932), whom the king had met at the World Fair in Paris in 1900. 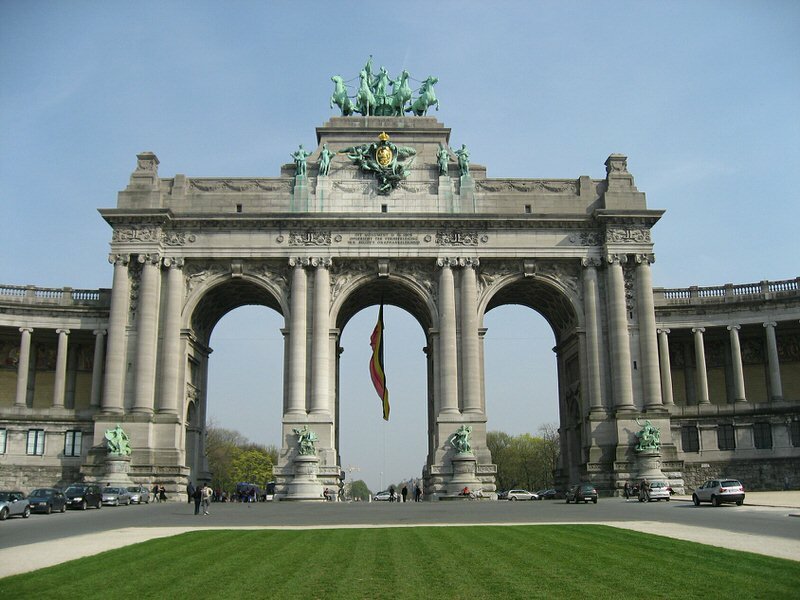 For this particularly symbolic monument, the architect proposed a triple arch (30m/100ft wide) in the Louis XVI style, differing from the commemorative arch of Antiquity in that its three openings are of equal dimensions. The decorative program is intended to attract attention. 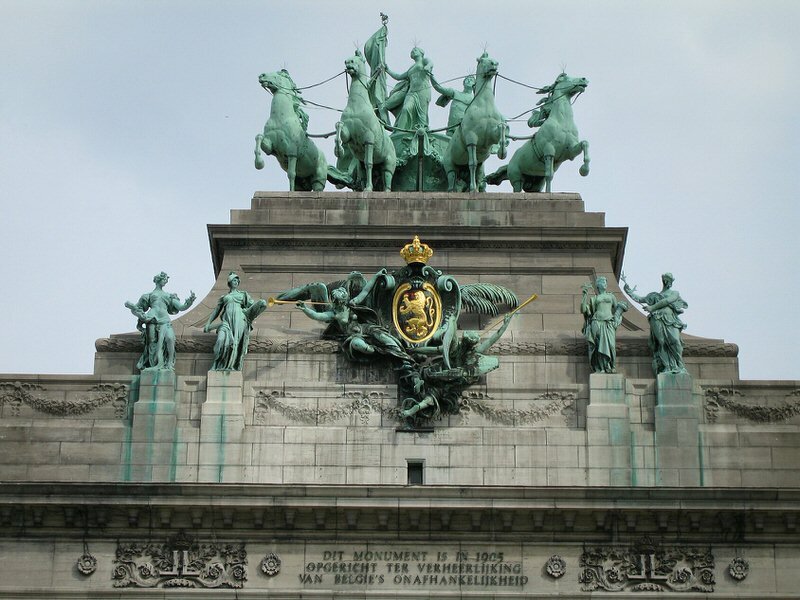 In the eyes of the people of Brussels, however, the quadriga alone — Brabant Raising the National Flag, by Jules Lagae (1862-1931) and Thomas Vinçotte (1850‑1925) embodies the Golden Jubilee. Eight allegories of the provinces occupy the base of the monumental arch (the ninth is depicted in the quadriga). The allegories of Fame (winged female figures blowing on a trumpet) in bronzed plaster which once decorated the four corners of the upper storey were removed in 1910 and not replaced by the bronzes originally designed to go there. In 1888. Gédéon Bordiau conceived the idea of a comprehensive museum. 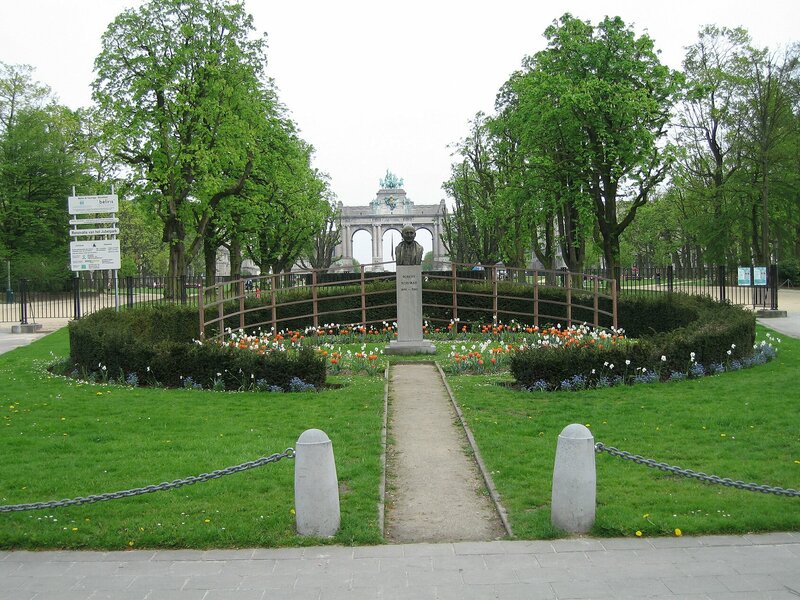 The idea naturally appealed to the ambitious views of Leopold who wanted to give his country an image in keeping with the European power it had become during his reign. 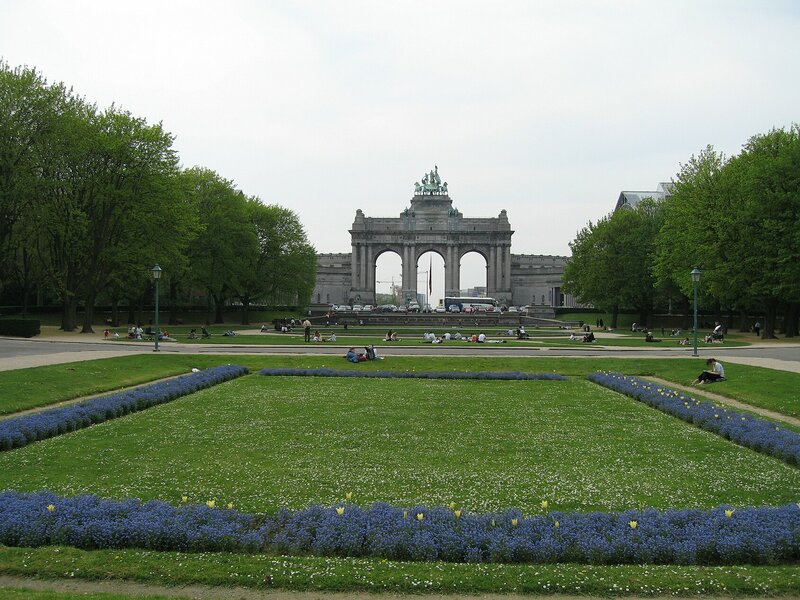 The cinquantenaire (Jubilee Palace) is therefore a place of education and edification which will gradually develop according to the vicissitudes of History. 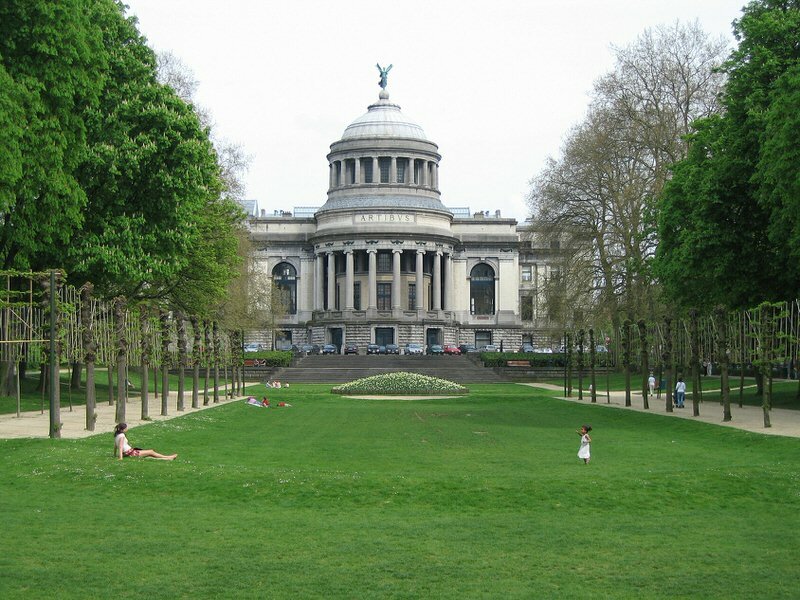 Today, the buildings house the Musée du Cinquantenaire (south wing, divided into the Nervian wing and the Kennedy wing, added in 1966). The Musée de l’Armée (Army Museum, north wing and hall) Autoworld (south hall), a casting shop (south hall), and the laboratories and library of the Institut Royal du Patrimoine Artistique (IRPA — Royal Artistic Heritage institute), built in 1962 on the side of the avenue de la Renaissance. 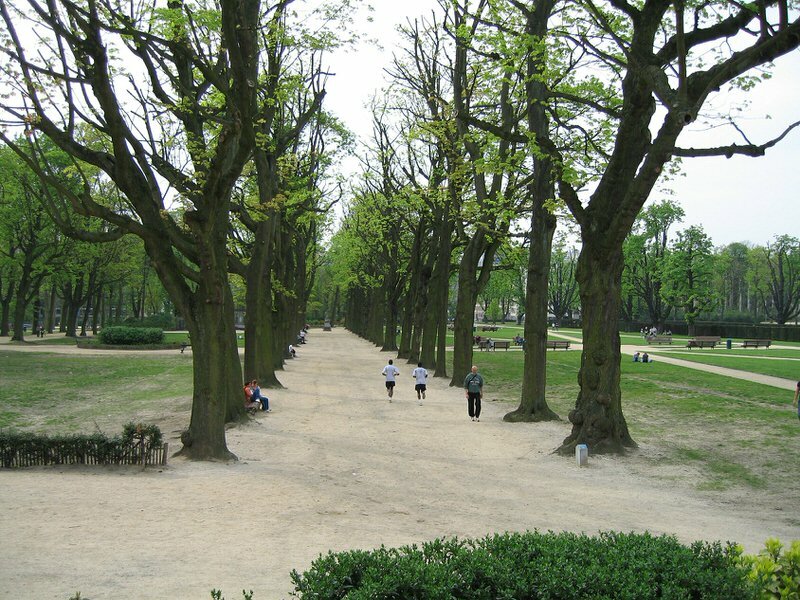 The park, designed by Gédéon Bordiau, is the suburban equivalent of the Parc de Bruxelles, or Brussels Park. It consists of a formal garden (in line with the palace) and landscaped gardens (along the sides) but is being developed only gradually. Certain parts of the park date back to the 1880 and 1897 exhibitions, and the plantations date from 1888 (elms, oleanders, acacias, chestnut trees). 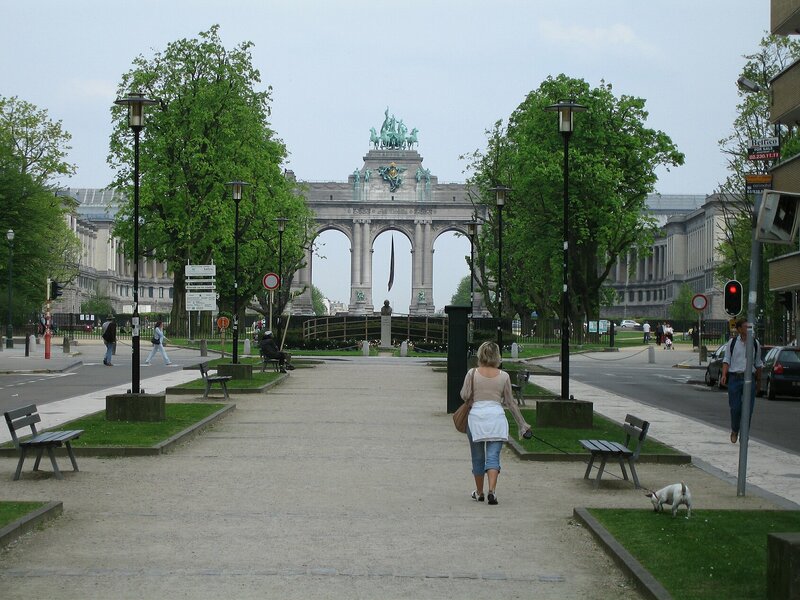 The land was used as a fairground up until 1930, when the Heysel exhibition grounds were opened in the northern, part of the town. An expressway was built through the park in 1974. There are various monuments. In 1889 Victor Horta built the Pavillon des Passions Humaines, a small open temple-like construction dedicated to human passions which, although still somewhat removed from Art Nouveau, already shows a certain mastery of this type of architecture which was soon to achieve universal renown. The pavilion was created for the sculpture of the same name by Jef Lambeaux. It was soon walled up, however, initially at the request of the authorities who considered it to be immoral, and also at the request of Lambeaux, who believed that his sculpture was not being shown to advantage by the zenithal lighting designed by Horta. Closed after three days, the pavilion has never been finished. Several sculptures lie along the path, including Le Faucheur by Constantin Meunier, Les Bâtisseurs de villes by Charles van der Stappen, and allegories of the seasons at the western entrance. The small tower of Tournai, a medieval pastiche from the end of the 19C, was built to glorify the architectural qualities of Tournai stone. The former “Panorama of Cairo”, built in 1880 by Ernest van Humbeek in the Moorish style, was restored and turned into a mosque in 1978 by the Tunisian architect Boubaker. 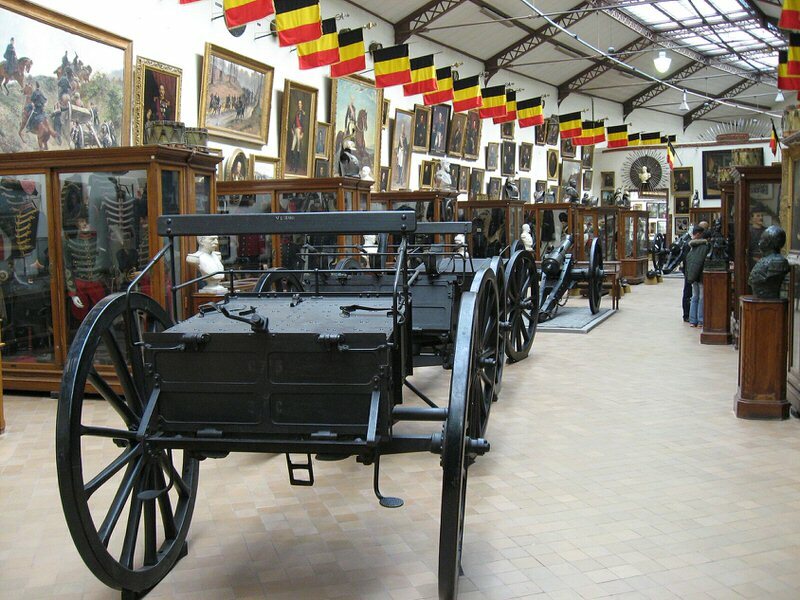 The Royal Museum of the Army and Military History was created in 1910 at the Abbaye de la Cambre at the initiative of Louis Leconte, a carabineer who was its first, extremely dynamic curator. The museum moved into the Palais du Cinquantenaire in 1923. It is potentially the richest in the world, extending far beyond National military history and containing a number of extremely diversified collections owing to the very fruitful acquisition policy adopted by Louis Leconte. unfortunately, a large number of pieces are in reserve. The museum is currently being completely reorganized which means the visitor may find a few surprises or changes with respect to the description below. A library with a total of 450 000 volumes is open to the public.